This weekend we went to see Hugh’s parents in the Peak District. Our visit was at the same time as the exciting Whaley Bridge Festival! We saw displays by the police, fire brigade, RNLI (even though there is no sea close by) and Morris Dancers. There was also a fair. 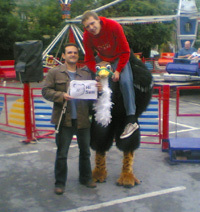 We spotted this man dressed as a man riding an ostrich. When we asked if we could take a picture with him, he said that his name was Sam! Another landmark reached – over £2000 raised from 50p books. Amazing in just over a year! It’s interesting to see what sells quickly and what doesn’t appeal. Even for 50p you’d think the book on Great Indian Battles of the 19th Century would be worth a try…. but no! A regular clear out is needed. Books are taken down to the local community centre who have a different clientel desperate for Mills and Boon and books on warships. Each to his own! It means though that stuff4sam is in turn supporting a charity by donating our unwanted books elsewhere! Spread the love, that’s what we say. 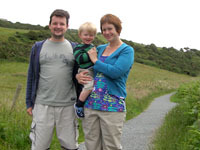 One year today we launched the Stuff4Sam blog! We started the site up to follow the progress of various sponsored events being done to raise money for Sam. 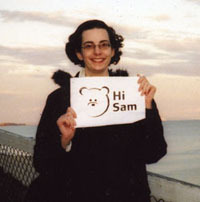 Since then it has grown into a place to share news and events with Sam’s community. Some posts have been serious, some silly, some have encouraged you to join in either with Hi Sam messages or to start your own money-raising feat. Traffic has increased over the year and we now get visitors from all over the world. Welcome, one and all! Leave your comments and join Sam’s community by doing something to get involved. This is me in a restaurant in Borneo where we had delicious food. I’d just finished trekking in the jungle which was great fun, even though there were lots of horrible leeches! 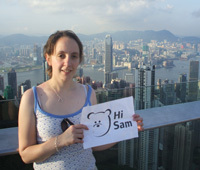 Hi Sam from Hong Kong! We’ve just been to Hong Kong. This picture was taken at the top of the Peak so it makes all the REALLY tall buildings look tiny. Hong Kong was quite hot and stuffy so we liked being inside with the air conditioning. We ate lots of noodles and sushi which we really loved. In July we will be going to South Africa so we’ll try and send you a picture from there too. 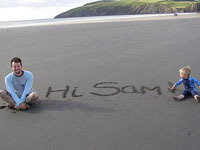 The Hi Sam pictures have been flooding in since we started the site in June 06. We’ve had messages from near and far and its time to up the stakes! Most creative sign – make your own! Are you going somewhere exotic or dangerous this summer? Even if you are not, get creative and send Sam a message. How to send us a Hi Sam picture. Sorry no prizes, its just for fun (unless we come up with something at the last minute). All Hi Sam pictures received by 31 August 2007 will be considered. Previous Hi Sam pictures will be included. Here I am at the top of the zig-zag path that goes all the way down the cliff to the sea at Bournemouth. Last weekend we visited Sam and his parents. It was lovely to see them all. We took a walk round a nearby field and Sam gave the orders from his chair! Afterwards we sat in the garden in the June sunshine catching up about Sam and the trip to Japan. Hugh entertained him (and us) by falling off the toy tractor and Chris enjoyed playing with the dog! We noticed some changes since we visited last September. Sam was talking more and was very observant of everything going on around him. He had grown quite a lot but was the same happy, cheeky boy we met last year! We hope to see you guys again soon.